ISOMORFISMI SUONO LUCE is a series of works presented at the Venice Biennale. In this animation real world images, digitized with a camera, are processed and edited along with abstract synthetic sequences. The music is made up of synthetic and recorded sounds. In this animation the whole screen is colored. As in STUDIO 1 and STUDIO 2, pitches are mapped onto hues, and brightness onto loudness. The music of STUDIO 3 is a random sequence of sounds. 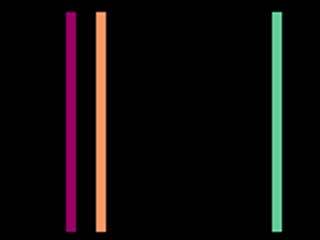 In this animation, which follows STUDIO 1, each colored rectangle corresponds to a note of the musical scale, and is shown only when its note is played, creating a sort of colored scale. This is a variation over the theories of the Italian painter Luigi Veronesi. The two musical voices are only heard, while the third voice is only visualized. Rectangles’ hues are established by sound pitches, while luminosity represents loudness. The music of STUDIO 2 is the same used in STUDIO 1. 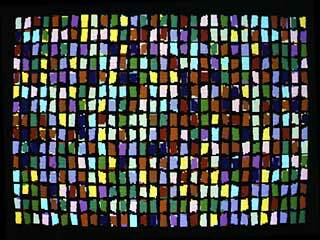 In this animation each colored rectangle corresponds to a note, following the theories of the Italian painter Luigi Veronesi. 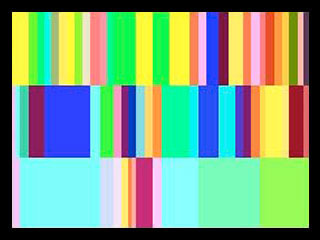 Every horizontal stripe of the animation represents a musical voice. 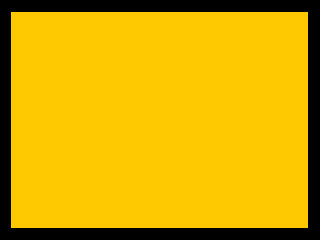 Rectangles’ width is set by notes’ length, while sound pitches control rectangles’ hues, and brightness is related to loudness. Rectangles appear on the right side of the screen in synch with the correspondent notes. The music of STUDIO 1 is the musical offering by J. S. Bach, a piece that wasn’t meant to be played on a specific instrument.